This great political diversion has high content and replay value in a value-priced game. Players can follow real life counterparts or create their own presidential candidate. 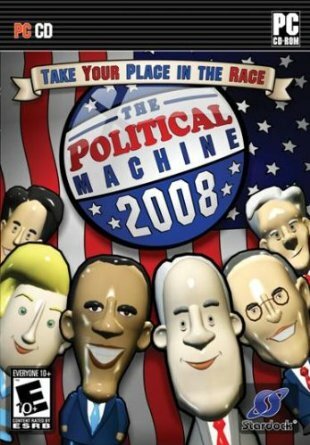 The game features an election campaign mode and other modes that are entertaining as well as informative. This high concept title expands with nicely a wide range of options while using real names and likenesses for the candidates through the election process (no primaries this time, maybe in the next edition) with 270 electoral votes needed to enter the White House. The statistics-based game play features a cross-country map (Alaska and Hawaii included) with sharp icons and helpful zoom features. Players build up points, which vary in each place, in a simple five bar format (at the bottom middle). Activities include creating ads, making speeches, fundraising, building headquarters, and special interests. Other fun customization includes picking a candidate’s platform on current issues. At the beginning, more than 100 points seem like enough, but they go fast when you have to designate just over 20 points to get a stronger opinion on one side or the other. It’s basically a quick process once you discover your candidate’s strengths and weaknesses. Players must master time, individual candidate stamina (a limited amount on each turn), and political influence through the outreach centers and consulting offices. A good balance of endorsements, fundraising and awareness usually equals success while a wide choice of fun freedoms allow for some funny experimentation. Individual characters like a consultant (raises awareness up 4%) or speech writer help the most while webmasters, intimidators and even fashion consultants also factor into game play. Players who experienced the first Political Machine release four years ago can experience essentially the same format with some logical improvements and nice customization options. Players get more operatives, more game lengths (ranging from short-21 weeks, to epic-121 weeks), varied difficulties (four easy, one normal and five hard) and more polished graphics including the bobble head faces, which can be turned off. Several additional campaigns including a clever Stardock crossover campaign, provide the main game play. Two campaign scenarios are realistic while the other two provide entertaining diversions from reality. This satirical game mines a unique genre fresh to most gamers while being affordable without sacrificing content or graphics. Expansions beyond the two-party system probably won’t help much, but easier online access, expanded storyline options (scandals from beginning to end, etc.) that build on characters with potential (like “The Fixer”) would be great in the 2012 edition. An excellent price for a title at the top of the simulation game genre. This entry was posted in Video Game Reviews and tagged Michael Siebenaler, Mike Siebenaler, PC Games, Political Machine, Tall Writer, video games. Bookmark the permalink.